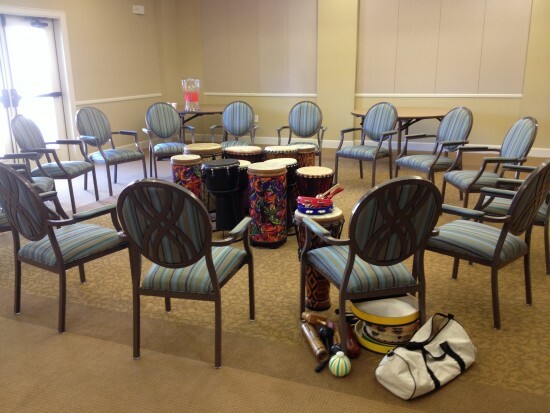 Group drumming can be a cost-effective solution for your corporate groups, school programs, youth groups, employee wellness, community celebrations, and much more. 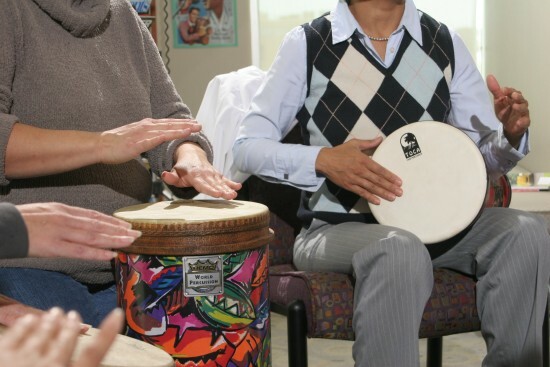 Drumming Around offers a variety of programs suitable for many different populations and settings. 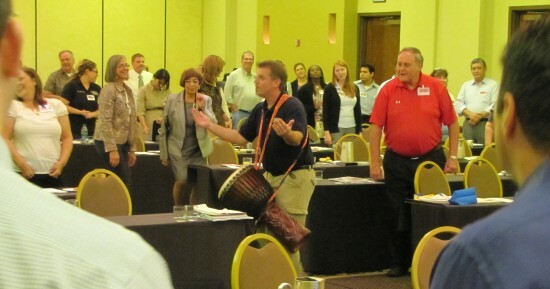 Drum Circle programs can also be customized to fit the particular needs of your group or event. We are based in San Antonio, TX, but willing to travel (inside the US or Internationally) . Let us know what your needs are so we can tailor a program specifically for you! Drumming Around team building programs are designed to help companies and organizations step outside the box to explore new and creative ways of developing the communication and listening skills of its employees. The steps involved in successfully creating music together provide powerful synergy and enhanced camaraderie among the participants. This is no ordinary "talk and chalk" presentation. As the team goes through the process of playing music together, individuals develop a common language and develop communication skills at a deeper level that is possible with "regular" team building activities. Through this fun and creative activity, participants are removed from the business environment and play together to create a musical experience that is greater than the individuals involved. This helps to deepen the feelings of "COMMUNITY" in the process. In a single program, this hands-on, interactive experience can achieve a team dynamic that participants will carry back to their everyday work environment and reap long lasting benefits for the employees and the employer. Kevin Cooley has been a professional musician since the age of sixteen and has performed in a variety of musical styles and settings. In addition to his musical experiences, Kevin has worked as a salesperson in several different industries. After several years in the health insurance business Kevin decided to once again pursue his passion and founded Drumming Around; a company dedicated to providing rhythm-based activities designed to meet specific community-building, corporate training and wellness goals. 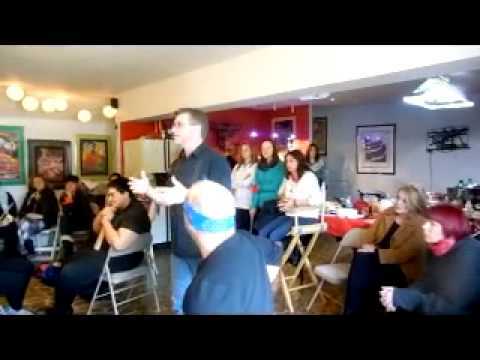 Whether he is training a corporate group, working with retirees, community groups or with children with special-needs, Kevin's musical background combined with his business experience and love for people gives him a unique perspective. -Your event should be held in a room where people can be loud...we are talking about DRUMS. A carpeted room is preferred. Please make sure there is not a “quiet” meeting being held next door. -Chairs without armrests are preferred. This allows ample room for natural movement while drumming. -While we can accommodate a variety of seating arrangements, it is preferred that chairs be set-up in concentric circles with enough room in front of chairs for instruments. “Set-Up Diagram” can be provided, if needed. 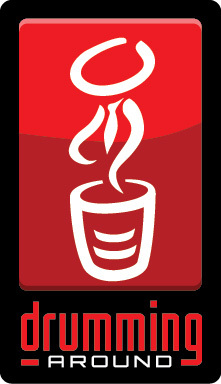 -Our goal is to make your event a success. If the above seating arrangement is not possible, there are many alternatives. -For large groups, sound reinforcement may be necessary. Drumming Around will provide a wireless headset microphone. -PA system suitable for the size of the group to be provided by client or venue. -All drums and percussion instruments will be provided by Drumming Around. -If instruments must be shipped, shipping costs will be paid for by purchaser. Arrangements should be made to have drums delivered to venue at least two days prior to the event.